"Best book I've found on this subject." This edition is out of print, but widely available in a revised edition. Limited copies of this original are available from Nehemiah Ministries. E-mail us for availability and price, or further infomration. Are there steps I can take to find a mate? Should a woman take initiative in finding a mate? Blaine also offers counsel on how to deal with rejection and disappointment, and on how to discern between healthy and unhealthy fears and inhibitions. He looks closely at how our responsibility and God's relate in the whole process of finding and choosing someone to marry. 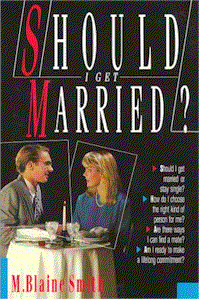 This book helps readers grapple honestly with this life-changing decision. Copyright 2005 Nehemiah Ministries, Inc.